Linkt, 830 N Milwaukee Ave in River West, is a 5-story building with 47 apartments, 24 garage parking spaces and ground-level retail space. It welcomed its first residents early in 2017. Akara Partners is the developer and bKl is the architecture firm. 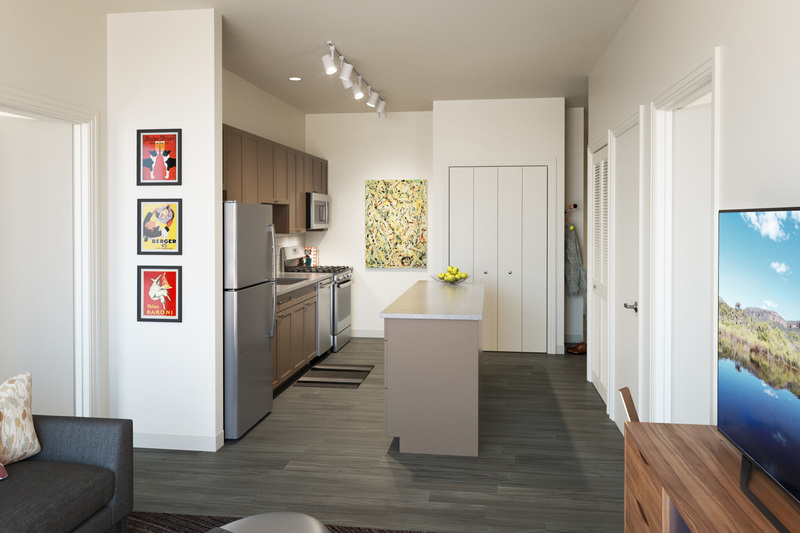 Linkt has a mix of studio to 3-bedroom, 2-bath apartments. 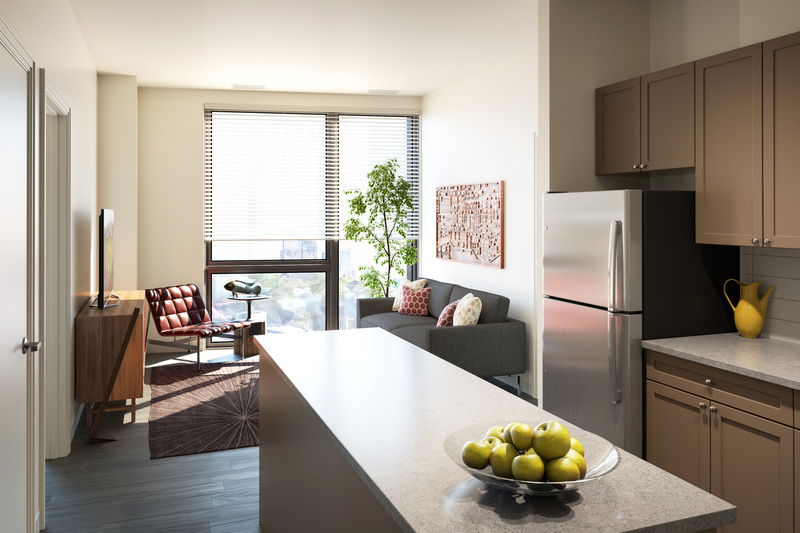 The apartments have high ceilings, plank flooring, in-unit washer / dryers and high-speed (500 mbps) Internet access. Kitchens have stainless steel appliances, quartz counters and under-mount sinks. Floor plans are available online. Views. At just five stories, Linkt is not a view building. That said, some of the units have an interesting skyline view toward the Loop. Linkt has a fitness studio with cardio equipment and free weights, a green roof deck, a grilling station, a fire pit, Pressbox dry cleaning lockers, and on-site heated parking. Linkt has a transit-oriented, pedestrian-friendly location in a rapidly-developing neighborhood. Shopping. A flagship Jewel-Osco is a half-mile south. There’s a CVS pharmacy a half-block away at Chicago and Milwaukee. Linkt has good proximity to neighborhood bars and restaurants. 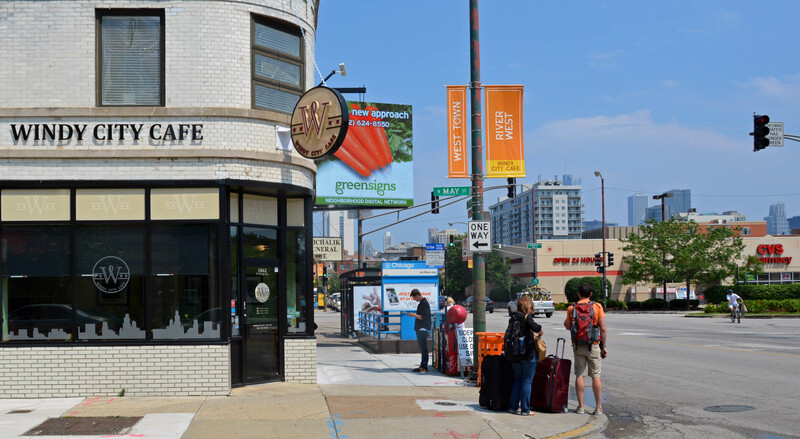 The Silver Palm and The Matchbox, Big Shoulders Coffee, Pie Eyed Pizzeria, Sushi X, Windy City Café, Gelato Greco, D’Agostino’s and more venues are near the intersection of Chicago and Milwaukee. Parks, recreation. Linkt has good access to a nearby public park. Eckhart Park has baseball diamonds, a playground, a basketball court, a fieldhouse with a fitness center, and the Ida Crown Natatorium. The CTA Blue Line stop at Chicago Ave, just south of the building, connects to the Loop and O’Hare Airport. The CTA #56 bus along Milwaukee Ave travels to Wicker Park, Bucktown, Logan Square and the West Loop. The #66 Chicago bus affords quick travel to Michigan Avenue’s Mag Mile shops, Loyola’s downtown campus, Northwestern Memorial and Lurie Children’s hospitals, and Navy Pier. Access to I-94 is a minute away. Cyclists will enjoy having Milwaukee Avenue’s “hipster highway” outside their front door. 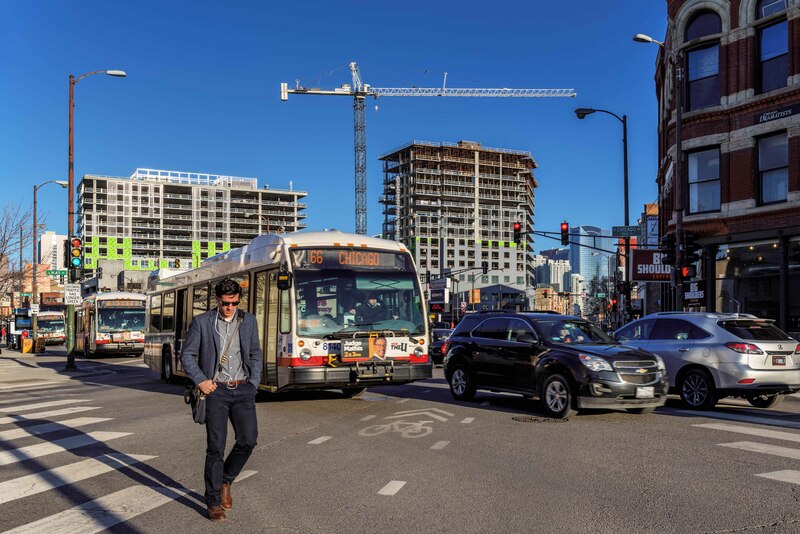 The bike lane provide quick access to River North, the Loop, Wicker Park and Bucktown. Rentals are typically available in a number of nearby condo buildings, sometimes at lower rents than in the managed apartment buildings. You can see River West and Fulton River District apartment locations on the following map.